These gemstones are really unique. The ocean jaspers have obicular patterns and semi transparent colors. 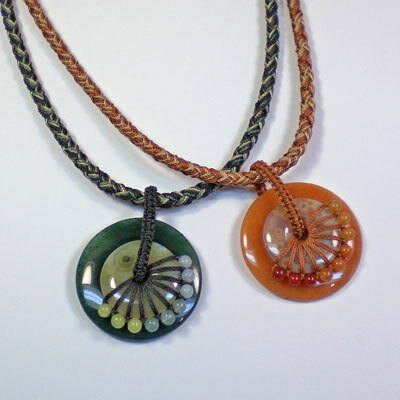 The necklace on the left has a green aventurine framing the soft lime jasper, jade, lime serpentine and green aventurine beads, dark green knotting and a matching braid. The necklace on the right has a peach aventurine as a background, aventurine and carnelian beads with matching colors for the knotting and cord. Knotted with nylon thread and assorted gemstones beads. The large donut is 40 mm in diameter. The smaller donut is 25 mm in diameter. The braided cord is 5mm in diameter. The clasps are gold filled with a lobster clasp.